By buying this product you can collect up to 152 Yachtaid Points. Your cart will total 152 points that will be converted into a voucher towards your next purchase! Must be logged in to collect points. 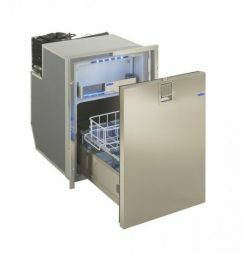 The DR 49 Stainless Steel is a new, space-saving, drawer unit with a 316 grade stainless steel door front. The interior is designed to suit international cans and food packs with two robust drawers, conventional international sizes of integrated adjustable bars, freezer compartment and internal blue LED light. Total Volume / Capacity: 1.7 cu. ft.